What does ept GmbH do to protect the environment?What is an energy management system according to DIN EN ISO 50001?What is the environmental management system standard ISO 14001?Does ept have both certified environmental management and certified energy management schemes?How does ept measure and check energy efficiency?How do environmental protection and energy management work in Augsburg, Germany? What does ept GmbH do to protect the environment? We minimize our ecological footprint by implementing an energy management system according to DIN EN ISO 50001 and an environmental management system according to ISO 14001. Additionally, we have been implementing energy-saving measures and relying on renewable energies for years. 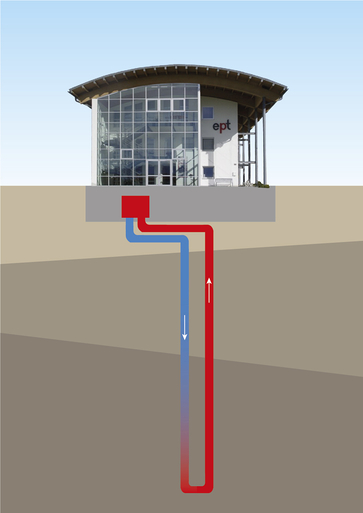 Examples include our use of geothermal and solar energies at the ept plant in Buching, Germany. What is an energy management system according to DIN EN ISO 50001? The DIN EN ISO 50001 standard was published on 11 June 2011 by the International Organization for Standardization (ISO). The standard describes the implementation of systematic energy management: A structured approach in which organizational and technical processes as well as behaviors are adapted to specific energy policy goals. The systematic energy management is based on a record of energy flows within a company. This is linked to an assessment of energy efficiency status, in particular of those installations and facilities, as well as processes and activities, that are important for overall energy consumption. If implemented successfully, the energy management system decreases the company’s total energy consumption. This also reduces the energy required for production, as well as the consumption of raw materials and additives, leading to a steady improvement in the company’s energy efficiency. The energy flows are systematically recorded by the energy management system, informing investment decisions in energy efficiency. An effective energy management system will shape energy policy (including strategic and operational objectives and action plans), planning, implementation and operation, monitoring and measurement, and control and correction, as well as internal audits and regular management reviews. ISO 50001 is considered a classic management system standard that can be applied to all organization sizes and types. This standard should be understood as a framework, setting the minimum guidelines within which an individual organization must operate. What is the environmental management system standard ISO 14001? ISO 14001 describes the global standard for environmental management systems. It was published by the International Organization for Standardization in 1996 and amended in 2015. It focuses on a continuous improvement process to achieve an organization’s previously defined environmental goals. (The organization could be a company, service provider, public authority, etc.) In Germany, some 8,000 companies have implemented an environmental management system in accordance with ISO 14001. The central components of ISO 14001 are planning, execution, control, and improvement. During the planning phase, environmental objectives and corresponding measures, responsibilities, and procedures are defined. The planned measures are carried out and validated with a corresponding check. Any weaknesses identified are addressed by adapting responsibilities, procedures, and measures and, where appropriate, adjusting environmental objectives. Does ept have both certified environmental management and certified energy management schemes? Yes, ept operates a certified environmental management system in accordance with ISO 14001:2015 and a certified energy management system according to ISO 50001:2011. These two management systems are reviewed and certified at regular intervals by an external certification body. Additionally, a management review is conducted once a year to set new environmental goals. We all share one environment and it’s the only one we have. In an effort to protect it, our company is committed to sustainable planning and technical processes, and to an economical use of natural resources. We commit to continuous improvement of our environmental performance and to compliance with all applicable legal regulations at all times. Our environment management system meets the ISO 14001:2015 standards. The energy management system meets the ISO 50001:2011 standards. How does ept measure and check energy efficiency? Key figures are required in order to measure the energy efficiency of our company as well as any changes. So-called ‘Energy Performance Indicators’ relate the energy consumption of the company to other operational parameters. For example, the key performance indicator for ept is the energy consumption divided by the value added. Individual areas or departments, in turn, have their own department-related key figures. The stamping department, for instance, determines the average energy applied per stamped part. The consumption of energy sources such as compressed air, heat, gas, or electricity is measured on site through the use of data loggers, which are attached either to the interface of individual departments or even to individual machines. The data loggers then send their measured values to a central energy management software, through which the key figures can be clearly assigned, read out, and presented visually in detailed diagrams. An example of this are the so-called Sankey diagrams, which comprehensibly break down the total energy consumption of a plant as percentages, down to the individual user. How do environmental protection and energy management work in Augsburg, Germany? In 2013, an energy-efficient electroplating system was commissioned at the Augsburg plant. It already consumes 30 percent less energy than previous systems. Additionally, it is fed by district heating. The rinse water flows in a cycle through an ion exchange system, where it is cleaned and returned to the electroplating system. As a result, our strip electroplaters are very efficient in terms of water usage. Our annual wastewater numbers are well below the legal limit. Recyclables are also conserved: Water with valuable ingredients passes through several rinsing processes after the main bath. The valuable materials are recycled in a cascade-like fashion, directly into the main bath. Any sludge produced is recycled by an external company and resulting filtered residues, such as nickel and tin, are processed into new pellets and recycled. The strip electroplating lines built in 2018 offer additional energy-saving measures. How do environmental protection and energy management work in Peiting, Germany? In Peiting, a gas-fired combined heat and power plant (CHP) generates up to 70 kW in one hour, covering 10 percent of total consumption. The CHP provides the necessary heat for the bath heating of the electroplating system. Similarly, the electroplating system includes rinses to reduce flushing losses. Low-pressure compressors reduce the cost and power consumption of compressed air. This also serves to ensure that the IT servers can keep running in the event of a power outage. How do environmental protection and energy management work in Buching, Germany? Buching saves 80,000 kg of CO2 per year from energy production using geothermal energy. Geothermal energy is used for heating and cooling at the Buching plant: 36 holes drilled to 80 meters depth generate an annual capacity of 297,000 kWh. As a result, this plant alone saves around 80,000 kg of CO2 every year. The plant also has a photovoltaic system, mounted on the roof, which generates 55,000 kWh per year. It powers the energy-saving LED lamps installed in the halls, among other things. What have environment and energy management systems achieved thus far? Germany and the European Union have set ambitious energy efficiency targets. To achieve the EU energy-savings target, the Energy Efficiency Directive 2012/27/EU was adopted. Within this framework, Germany has set itself the target of reducing its primary energy consumption by 20 percent by 2020 and by 50 percent by 2050, as compared to 2008.
ept set 2013 as the starting point for the calculation of primary energy consumption. From this year onward, the company has set itself the goal of reducing primary energy consumption by two percent per year. 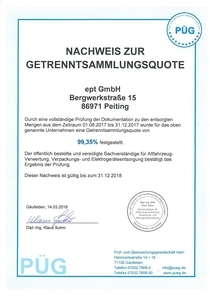 To achieve the 2020 target of 20 percent savings, ept GmbH would have to save 1.84 percent of its primary energy per year. We rounded up this value to two percent per year when defining our own targets. And we have already reached this goal! In 2014, we already managed to reduce consumption by almost ten percent. In 2015, our energy consumption was below the amount that was actually defined for 2020. 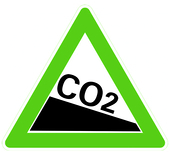 We have also consistently reduced the CO2 emissions of our plants. From 2009 to 2014 alone, CO2 emissions in the German ept plants were cut by 40 percent. Today, emissions have shrunk 34 percent from 2014 levels. Changes in energy management are also noticeable. Compared to 2014, total energy consumption has decreased by about 16 percent. And our plans for optimization continue: To reduce the compressed air consumption involved in electroplating, new suitable compressors and blow-off valves will be used in the future. In 2017, we received proof of waste separation rates of 99.35 percent. Continuous and comprehensive energy and environmental management protects both humans and the environment.